The arrival of heirloom tomatoes in the market always inspires me to make Gazpacho. This spunky, refreshing soup seems to please most every palate. 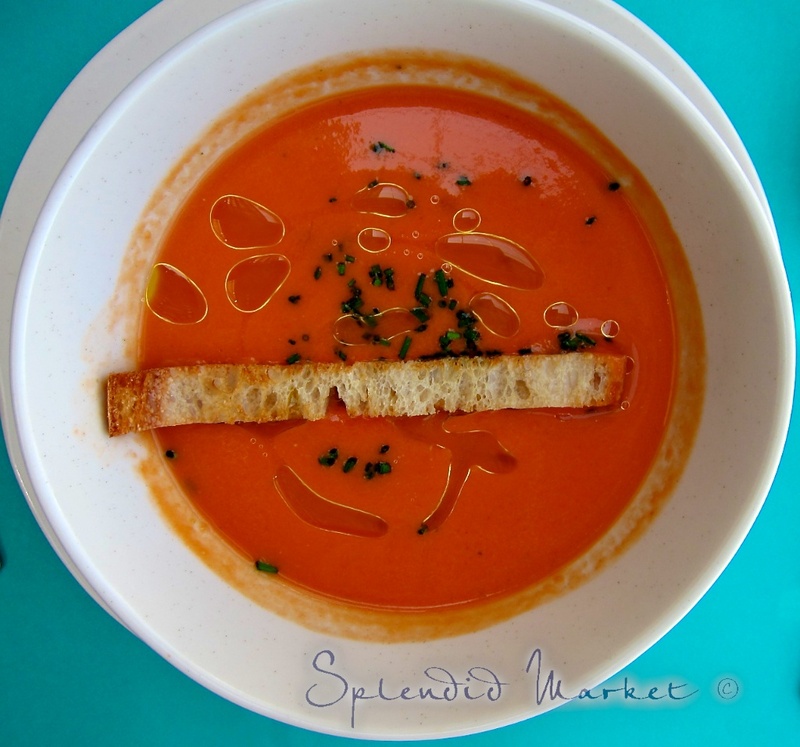 Now, after seeing how they serve it in Spain, I’m inspired to serve gazpacho with a fresh presentation…maybe I’ll offer a gazpacho “bar” with a variety of chunky options. When I make gazpacho, I marinate most of the ingredients overnight before blending the soup, so the vegetables can soak up the flavor of the other ingredients. This gazpacho will last for at least 3 days in the refrigerator, and tastes better each day it’s allowed to sit. Click on tomato for my favorite recipe. When pureeing the marinated vegetables to make gazpacho, I am always thinking of how chunky or smooth the soup should be. I usually leave it slightly chunky and add cubes of avocado and slices of scallions to the top of the soup for added texture and color. It seems the Spaniards have considered the texture question as well. 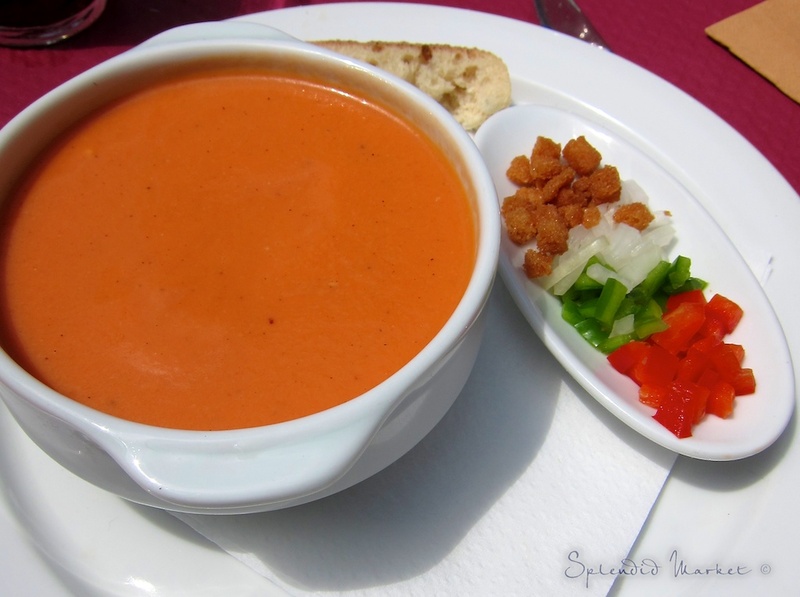 When we ordered gazpacho in Spain, the soup had a very smooth consistency, but it was usually served with a selection of chunky choices. My favorite was the presentation we enjoyed at the the restaurant Misa in a Palma, Mallorca. 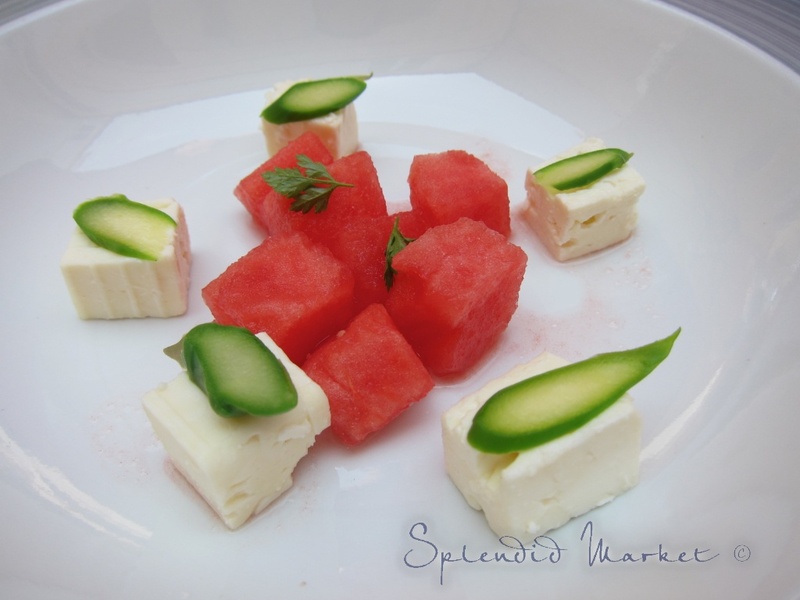 The soup plate was decorated with cubes of watermelon and feta cheese topped with thin slices of asparagus. Once everyone had their soup plate, the waiter poured the smooth, flavorful soup into the plate from a pitcher. The sweetness of the watermelon and saltiness of the feta were perfection. This serving style was used at many of the restaurants we visited. 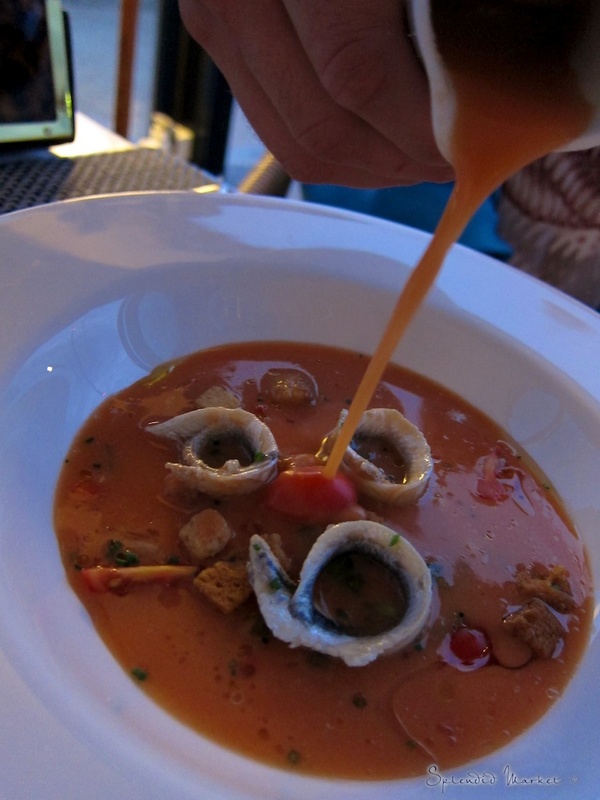 The spicy tomato soup was poured over rolled white anchovies and croutons at El Far on the Costa Brava. At the restaurant Racó d’en Cesc in Barcelona, they had the same presentation for the Vichyssoise. 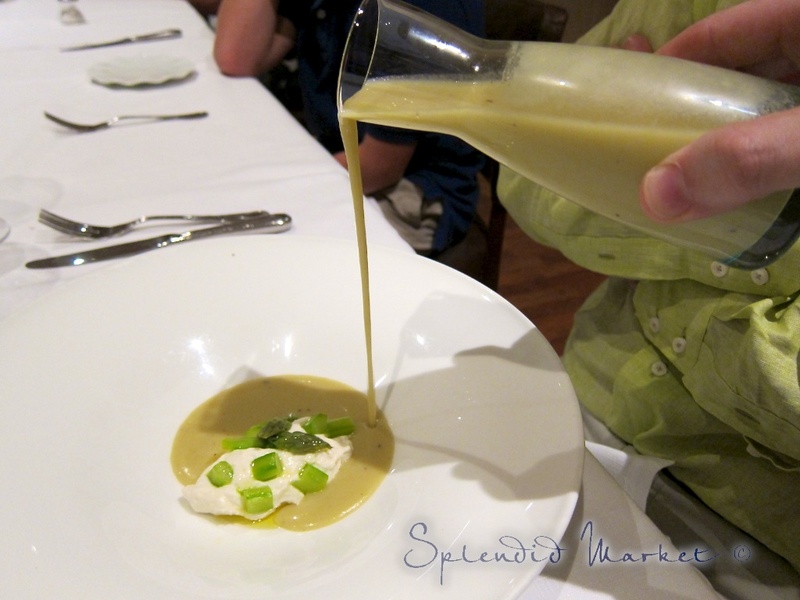 They poured the soup over some sort of a creamy lump, dotted with bits of green vegetables. Have you ever served Vichyssoise with caviar? It’s very suiting for a special occasion. Other restaurants served the soup with a side of chopped vegetables and croutons, allowing diners to leave it smooth or make it as chunky as they’d like. What I loved most about this soup, at a cute little restaurant on the beach in Barcelona, were the dribbles of olive oil….fat carries flavor. Here’s a whole different form for this popular soup. 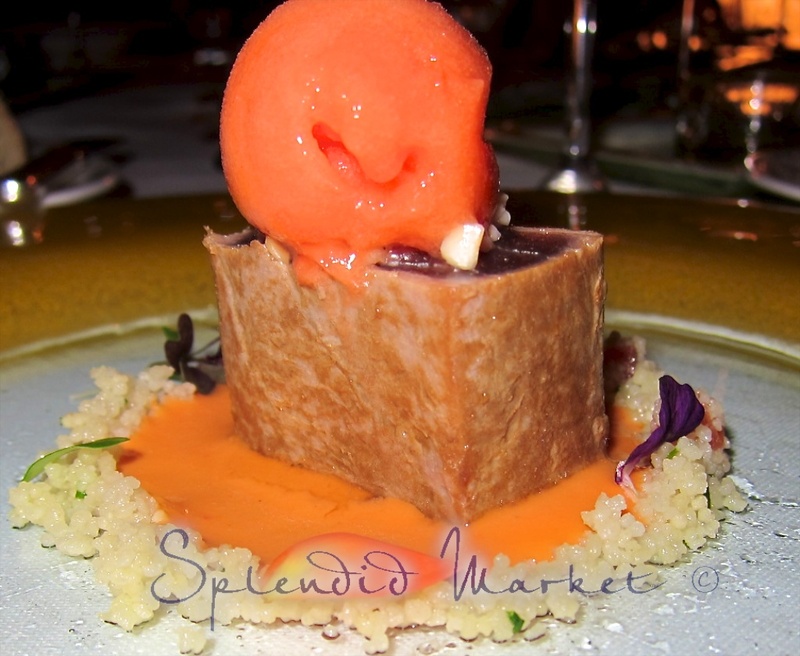 A frozen scoop topped my marinated tuna at the restaurant El Olivio on Mallorca. The flavor was delightful as it began to melt and spread over the tuna and bed of cous cous on the plate..
What beautiful pictures you have taken of such amazing food presentation! 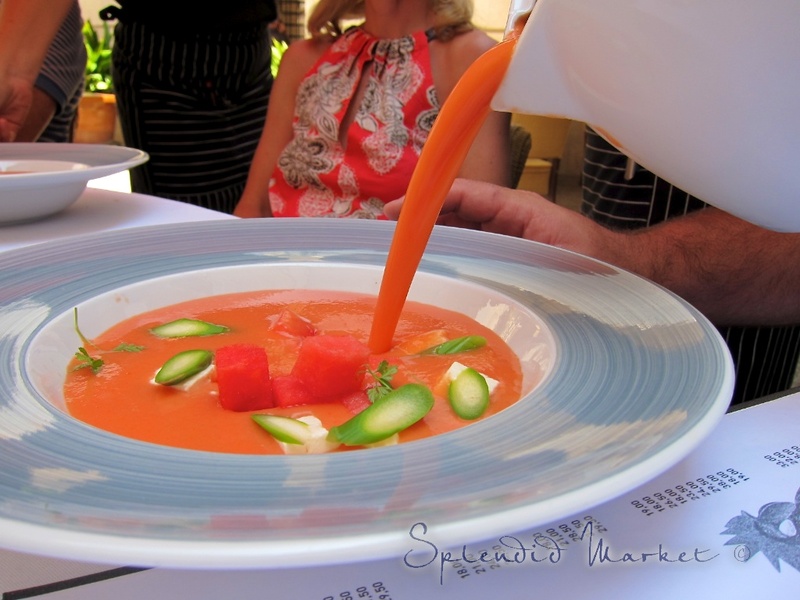 We had something similar in Madrid in May – the Madrid version of Gazpacho poured over an ostrich egg…loved the idea. 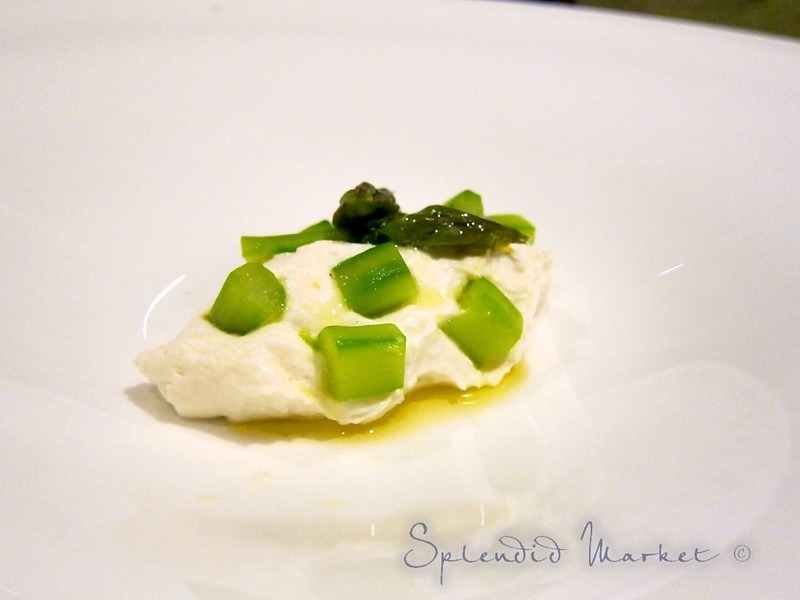 This post combines my love for food and travel so I really enjoyed it! Oh my what a fabulous gastronomic tour!! Every single one of these looks delicious and as always, your photos are splendid (how appropriate!). I've never made gazpacho because my husband is not a tomato fan – I'll have to try it sometime when all the kids are home!